Up to 7 October beer lovers meet in Munich for the Oktoberfest. This is the most famous beer festival in the world, lasting 17 days and attracting around 6.5 million people from all parts of the world. Munich is a beautiful city and above all, well organised. Many companies organise coach trips to the Oktoberfest which is definitely the most convenient way. The cost of attending varies depending on the city of departure and ranges from 65 to 110 Euro for the coach trip alone. For those who decide to stay in Munich, there are packages that include travel plus hotel, with costs ranging from 125 to 205 Euro. To these costs beer lovers must add the cost of the beer in the halls. A typical meal type for two people, comprised of 1 litre of beer, a half roast chicken and a pretzel, costs around 33 Euro, a pretzel costs around 4 Euro. 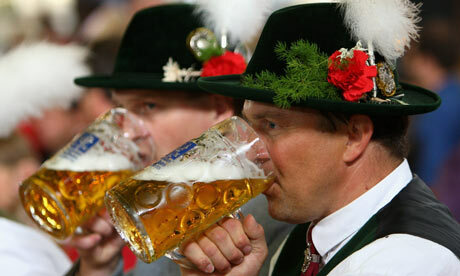 Those who go to the Oktoberfest usually spend the day drinking beer. A litre of beer costs 9.50 Euro, hardly enough to satisfy a beer-lover’s normal intake, so this cost must be multiplied by 2 or 3. Also be advised that if you pay in 10 Euro bank notes, the waitresses may not automatically give you the change and you will have to ask for it. Indeed it is customary to leave a good tip for the German waitresses. Remember that you can drink beer while standing only in the HB tent because in the other tents, you cannot drink if you are not seated. The high rate of alcohol in the bloodstream can lead to silly confusion, often forgetting something or somebody in the tents. Last year 555 wallets, 280 backpacks, 420 cell phones, 100 cameras were found and…even a number of children. The symbol of Bavaria and its patriotism, 18 m high, is the bronze statue of Bavaria. The statue is often used as a meeting point for people who have lost their companions, being Bavaria, it can be seen from almost everywhere. On weekends there is a huge crowd. The second weekend of Oktoberfest is called the “Italian weekend” because it is packed with around 100 thousand of our fellow countrymen and women.